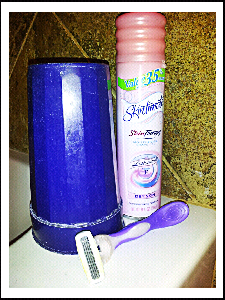 In order to conserve water and not feel rushed, I got an of plastic cup and my shaving tools. Filled the cup up with water and turned off the shower. Then shaved. I used the cup water to rinse of my razor when needed by swirling/shaking it in he filled cup. And then emptied out/refilled the cup between legs. It was so MUCH easier than a bath or shaving during a shower because the water never accidentally ran down my legs taking my shaving cream with it. And with not feeling “rushed,” I shaved faster than normal…..ingenious yet so simple. Wish this occurred to me before Haha. Previous Post Bathroom Cleaning in Seconds! !